Flying with toddlers is always an adventure, at the same time it is quite challenging as well. Certainly, it is not tough for anyone who is prepared for it and the more you are prepared the easier it gets. 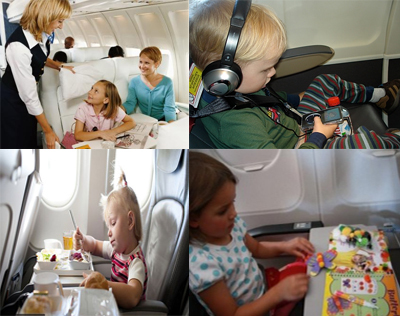 Managing toddlers in business class flights is easier then in coach. A small and simple tip for this would be have a game plan, leave unnecessary items at home and pack efficiently. Have some access to games, videos, educational programs in your ipad. Be sure to get kid-safe and volume-controlled earphones. drawing can be fun too.They can even use the stickers to embellish their pads. Reusable sticker books are yet another source that will add one or two hours of fun.Since there are dozens of different trucks to find out in this fun and lively book, this will keep your toddler sit in one place still for few hours. With nearly 400 reusable stickers, you can create scenes or you can point to a sticker and let your kids tell you what it a picture is of. They are easy to carry it off as well. Apart from this get some snacks which they love. Even though the challenge is real, success comes with having a good plan, allowing extra time, and packing the right snacks, toys, and books to keep your toddler occupied.